Lemon Ladies Orchard is a company that grows Meyer lemons located in Emerald Hills, California. They pick lemons every Sunday and ship them on Monday. I have been wanting to try these kind of lemons for about two years now but they do not sell them at any of my stores in Michigan. The season is short and will be ending very soon (that is why this giveaway is going to be quick). I was sent a dozen of beautiful little lemons. Let me tell you a little bit about how this lemon is different from the typical ones. They are much smaller, about half of the size. They also peel very easily kind of like a clementine. Also, the segments come apart like a clementine. I am a huge fan of sourness so I just eat the lemon plain and shared it with my family. We all loved it and thought that it was a little bit less bitter than a typical lemon. It is actually a cross between a normal lemon and a mandarin or a typical orange. I really like how this company is run by women. It seems to have a very small company feel that really cares about the lemons. They use organic fertilizer, sun, water, and love to grow these. 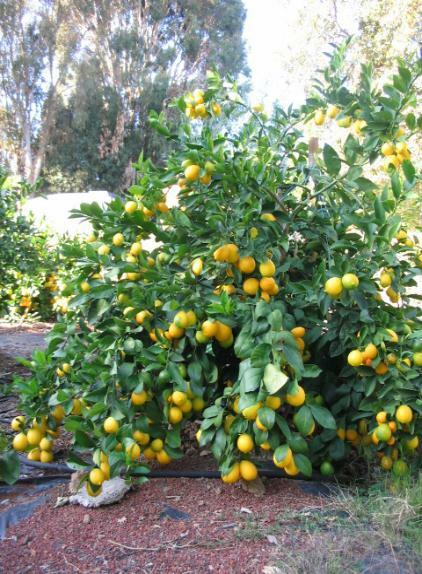 Their trees produce 6000 pounds of lemons in a season. I would highly recommend buying lemons from this company. They are delicious! ***You can buy a 6 pack of these lemons for $15 with shipping and handling included. They also come in larger amounts too. Just check out the website. The giveaway will be for a dozen of these delicious little Meyer lemons from Lemon Ladies Orchard. The giveaway is open until Midnight on Thursday April 28th. Winner will be chosen on Friday April 29th using Random.org. The winner will have 48 hours to respond or a new winner will be chosen. Let me know what you would use these Meyer lemons for! I'd make lemonade and lemon tart!! YUM! I absolutely love lemons. I add them to my smoothies, I bake with them, LEMON TART. Nom. I would use the lemons for my tea! I love water with lemon and I love making lemon squares and the chicken lemon. I would put them in all of these and more. You can order a Meyer Lemon Tree through Williams Sonoma....just ordered one for my garden and I will bring it in to the sunny kitchen during the winter!! I had a beautiful tree when I lived in San Jose, CA.....the best lemons ever!!! To make some lemon meringue pie. I would use these lemons to make lemonade and ice tea! I would make some lemonade. My husband and I LOVE fresh lemon on fish. I'd definately use these for that! I would use slices in water and maybe make a lemon pie. I would make lemon bars - yum! I'm a Google follower too. I would use these lemons to make lemonade, lemon curd, lemon tart and lemon creme fraiche! I would use them to make a lemon pie. I'd make homemade lemonade. With the economy the way it is, I always try to make things from scratch as much as I can. I think I would make a lemon meringue pie. I WOULD USE THE LEMON TO MAKE HOME-MADE MAYO OR A SIMPLE LEMON VINAIGRETTE FOR SALADS OR FRESHLY STEAMED VEG. We use lemons for many things but we love adding slices to a pitcher of water in the fridge. I found your blog through your card at Better Health and it is wonderful! I would love to make the whole lemon tart from Smitten Kitchen with these-- the tart uses literally the whole lemon so organic is the way to go and I hear it is amazing with Meyer Lemons! I would make my lemon poppy protein bars!!! No time to think about that one! I'VE SUBSCRIBE TO YOUR BLOG. my crumbled lemon bars... my son would be thrilled. it's been a while since i've made them. I put fresh lemon in my diet Coke! I would like to make lemonade and lemon bars! I would make Lemon Squares, and Raspberry Lemonade! i've enter the food should taste good giveaway. I would make a meyer lemon cake. I'd use them to make lemon meringue pie and to add to my cold brewed tea. Thanks. I would use the lemons to make lemon curd and then I'd make a scrumptious lemon tart with blueberries. YUM! I'd like to use these lemons for baking cakes, cookies, iced tea, over shrimp or chicken and lemonade. I would use the lemons to make homemade lemonade. Lemonade and a lemon creme pie! You know, sometimes, you just need to eat a lemon. If these taste as good as I think they taste, I'll just gobble them up. I want to make fresh lemonade. Biscotti would be first on the list!